I know that it looks like a "toy" and there isn't a lot of detail to it, but, it was a beauty on the track back in the late 80's. Would appreciate help or if someone has one too many. Thanks!! If Phil can't help I have a few but they are well used. Sorry Phil...I didn't get the email. I probably changed addresses since. I would like to hear from you again if you would resend your message to [email protected]. If you could send pics to [email protected] would greatly appreciate it. Will do. How many cars are you after? I'm looking for just one for my Hurley Haywood collection. I started out with the Brumos cars but expanding now to the Audis and the XJR5 that Haywood drove for Bob Tullius and the BMW that Gregg/Redman drove. I would like to get the IMSA version of the 90 since I can't find decals for those cars even from Pattos. This is the only version I have and mine are all damaged at the front. I went looking for the cars last night but they must have been put away somewhere safe. I'll have a better look for them tonight. When I say they are in bad condition I mean they are in bad condition. I forgot the kids have been using these. This is probably the best body and really needs the paint stripped and redone. I think the kids painted it in watercolour paint. I have all the windows, interiors and chassis to suit but you'd have to be desperate to get this one. There must be lots of better ones out there for sale. Last edited by Sports Racer; 12-07-2017, 02:17 AM. I certainly appreciate you getting back to me. 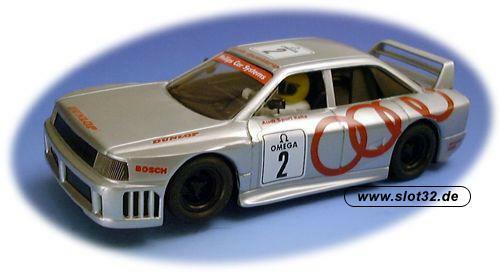 Yeah, it would take a bit of work.....if only we could get Bruce to start making the decals for the IMSA GTO Audi. Just for the asking, what wouldyou need on that little number? Just curious.